Long before either the Visitation or the Queenship of the Virgin Mary were celebrated on this day, and before those, St Angela Merici, May 31st was the feast day of St Petronilla. Although she is missing from the oldest Roman liturgical books, she is seen in a painting of the mid-4th century in the catacomb of Domitilla, where she was buried, and her name appears on lists of the venerated tombs of martyrs in the sixth and seventh centuries. In the reign of Pope Paul I (757-67), an ancient sarcophagus containing her remains was translated from the catacomb to the basilica of St Peter, the treasury of which still preserves a large metal reliquary with her skull inside it. The first edition of the Breviary of St Pius V carried over from its late medieval predecessors two brief Matins lessons of her life, which state that she was miraculously healed of paralysis by her father, relapsed, and while she was recovering again, a “count” named Flaccus conceived a wish to marry her sight unseen. Petronilla, “understanding that the human race’s most bitter enemy was readying an assault on her virginity, which she had dedicated to Jesus Christ”, prayed and fasted for three days, and then, after receiving the Eucharist, died. When St Robert Bellarmine and Cardinal Cesare Baronio revised the Saints’ lives for a new edition of the Breviary, published in 1602, these lessons were replaced with generic lessons from the common of Virgins, a clear sign that the traditional story was considered wholly unreliable. 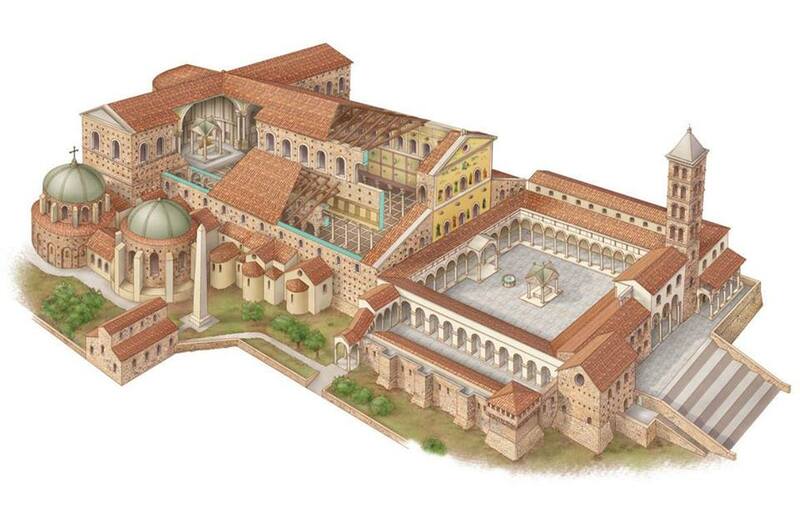 A reconstruction and partial cross-section view of old St Peter’s Basilica, with the mausoleum mentioned below on the far left. This structure was round on the outside, but octagonal on the inside. 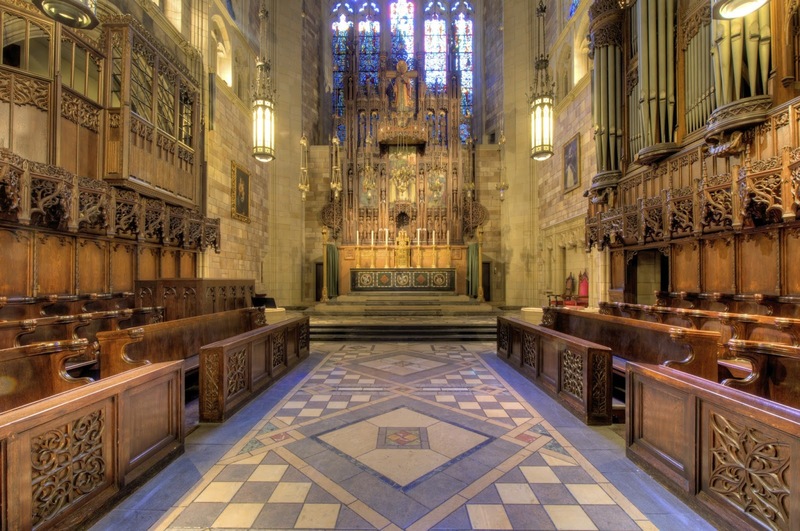 A narthex was later constructed between the left transept of the basilica and the rotunda, and doors opened up to form a passage from the church into the mausoleum. Another passage connected the mausoleum with its twin next door, also demolished by Vignola in the 1570s. In the middle of the 5th century, a large mausoleum was built next to the left transept of the Constantinian basilica of St Peter. Six of its eight internal niches later became chapels, with that opposite the door being dedicated to St Petronilla; for a long time, this chapel was under the patronage of the kings of France. 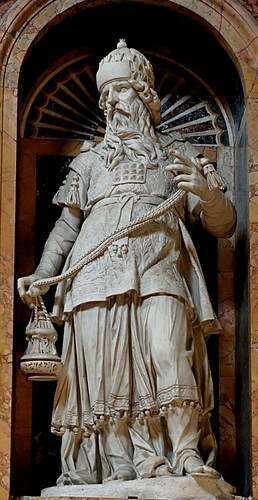 In 1498, Cardinal Jean Bilhères de Lagraulas, the French ambassador to the Papal court, commissioned his own funerary monument to be added to the chapel, from a 23-year-old Florentine sculptor named Michaelangelo Buonarroti. This is, of course, one of the most loved and admired sculptures in the entire world, the Pietà. 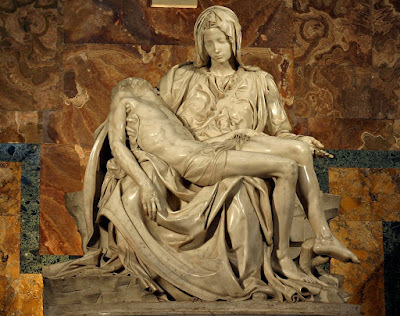 Michelangelo did not know, of course, that only 7 years after the sculpture’s completion and the Cardinal’s death, both in 1499, Pope Julius II and the architect Donatello Bramante would begin (though just barely) the process of replacing the ancient basilica, then in a pitiable state. Much less did he know that, after decades of delays, he himself would take the project in hand in 1545, at the age of 70, and spend the last 19 years of his life working on the monumental church which we have today. Although he lived to an extraordinary age for that era, dying 2 weeks before his 89th birthday, he knew full well that he would not live to see the project finished. It fell to his successor as chief architect of St Peter’s, Giacomo Vignola, to demolish the mausoleum where the Pietà originally stood, in order to make way for the left transept of the vastly larger new basilica. The Pietà now stands in its own chapel at the back of St Peter’s, and most of the thousands of people who come to see it every day never visit the chapel dedicated to St Petronilla on the opposite end of the building. (The new church is so much larger than the old one that this chapel in the northwest corner stands entirely outside the former footprint of the Constantinian structure.) Around the year 1623, the painter Francesco Barbieri (1591-1666), known by the nickname “Guercino” (“squinty” in the dialect of his native region, the Emilia Romagna), was commissioned to do a painting of the Burial of St Petronilla for this chapel. 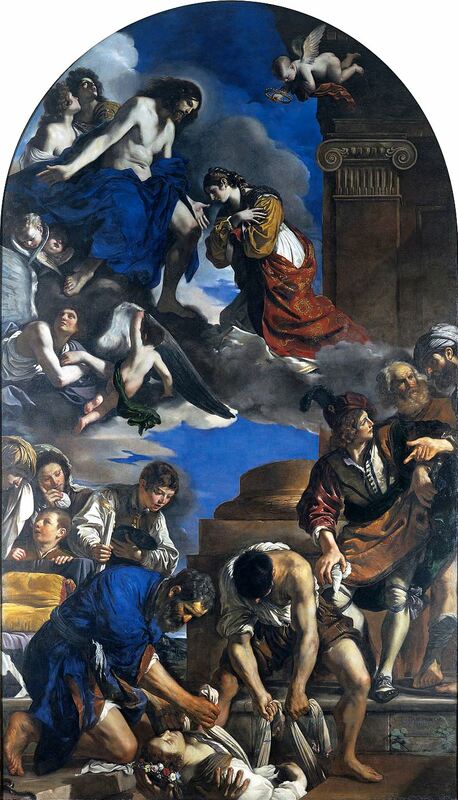 Guercino was especially admired for a remarkably vivid blue paint of his own invention, which he uses for two figures in this painting, as well as the sky in the background. 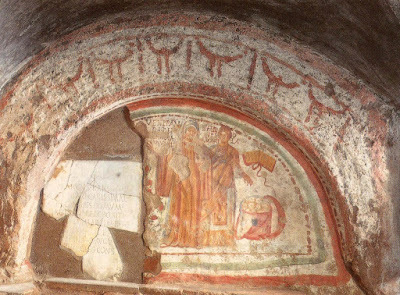 In the upper part, it clothes Christ as He receives St Petronilla into heaven. Although the historical St Petronilla was certainly honored as a martyr, as the legendary daughter of St Peter, she is honored as a virgin, but not as a martyr, and here she is shown receiving the crown of virginity, but not the palm of martyrdom. Below, notice the intense realism of the scene of her burial; we see the hands of a man standing in her grave, but only his hands, reaching up to help lower her body into it. 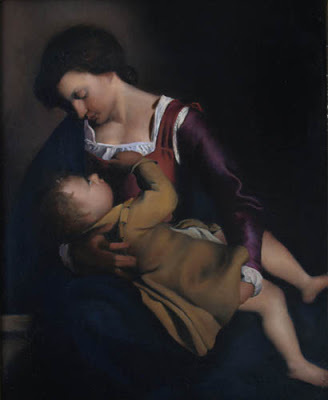 The fellow dressed in blue on the left is Guercino’s tribute to Michelangelo, whose most famous sculpture formerly graced the chapel of the same Saint for whom he made this painting. The face is recognizably his, and his massive forearm is very much that of a sculptor. (Even as a very elderly man, Michelangelo never ceased to work in his favorite medium, sculpture in white marble, a labor-intensive and muscle-building activity.) 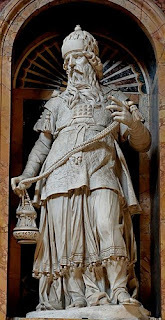 Surely by design and not coincidence, the chapel immediately next to that of St Petronilla in the modern basilica is dedicated to Michelangelo’s name-saint, the Archangel Michael. Our next major photopost will be for Pentecost, this coming Sunday, June 4th; please send your photos to photopost@newliturgicalmovement.org for inclusion. 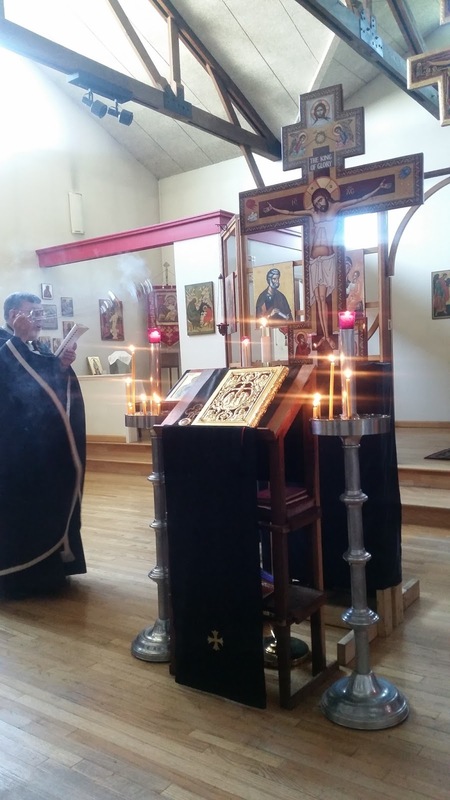 As always, we are glad to receive images of celebrations in both the Ordinary and Extraordinary Form, including the Vigil, as well as any of the Eastern rites, the Ordinariate Use, Vespers and other parts of the Office, and Confirmations. Please be sure to include the name and location of the church, and feel free to add any other information you think important. Evangelize through beauty! The Vigil of Pentecost will be celebrated according to Divine Worship, the Missal for the Personal Ordinariates, at Holy Rood Catholic Church in Oxford, England, on Saturday 3 June, starting at 5 pm. 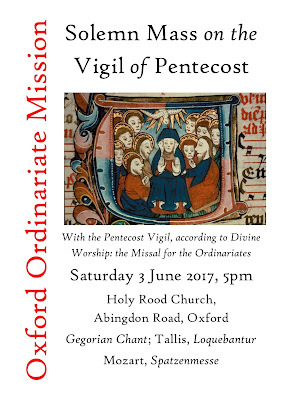 The music of the Mass will be Mozart’s Spatzenmesse, and Loquebantur variis linguis by Thomas Tallis. 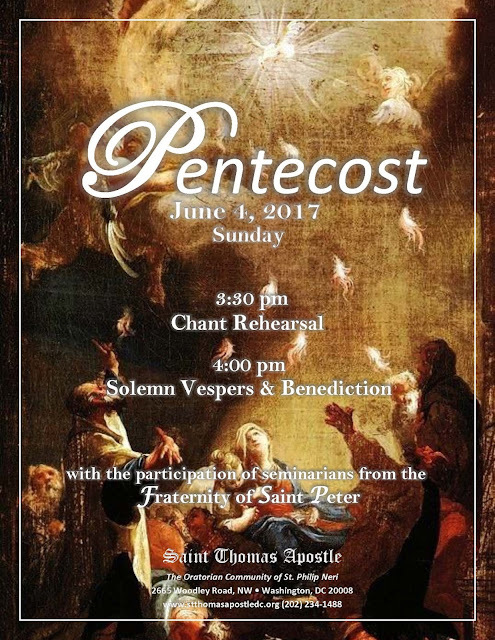 The history of the Pentecost Vigil, its lamentable suppression and partial restoration, are well known to our readers. 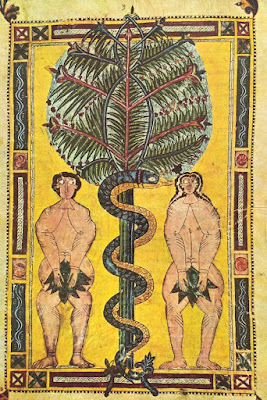 There may be some interest in the form of the Vigil given in Divine Worship, which provides two forms for it. The first is the Extended Form, the second is simply the Mass of the Vigil by itself, as is the case in the Ordinary and Extraordinary Forms. 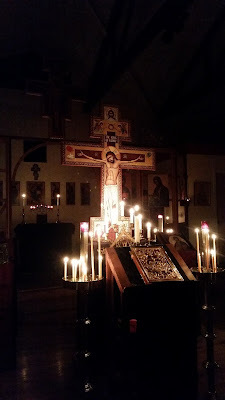 The Extended Form may be celebrated before or after First Vespers, but there is no provision in Divine Worship for the combination of Vespers and Vigil. The Vigil begins without ceremony. 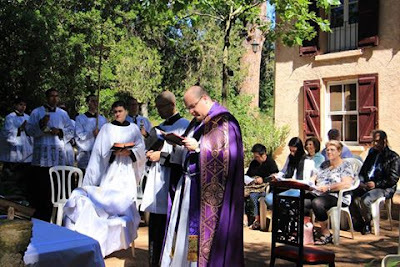 At the sedilia, the priest reads a short exhortation, a ‘traditional language’ version of that found in the Ordinary Form. Four Old Testament Lessons are read, with their Tracts, and a Collect after each one. There are four Lessons in the Ordinary Form, but this was not uncommon in other Uses of the Roman Rite, including Sarum. 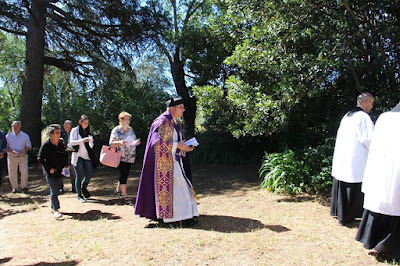 The texts for the Lessons and Tracts are those in the Ordinary Form: there do not seem to be Gregorian melodies for the Tracts, which are derived from the responsorial psalms set for the Ordinary Form Vigil. The collects, however, are almost all different. 1) is found the Sarum Missal, where it is the collect that concludes the Vigil, prior to the blessing of the font; it is given in A. H. Pearson’s translation; this collect is the Collect of the Mass in the Ordinary Form; 2) is the same as the Ordinary Form’s collect; 3) is identical to the pre-Pian Roman Vigil, and follows the same reading, from Ezekiel 37; 4) is a collect from the Church of England’s proposed 1928 Book of Common Prayer, for the Mission of the Church, derived from Acts 17:26, and found in other liturgical collections throughout the Anglican communion. After the Lessons, the priest and ministers proceed to the altar and lie prostrate before it. 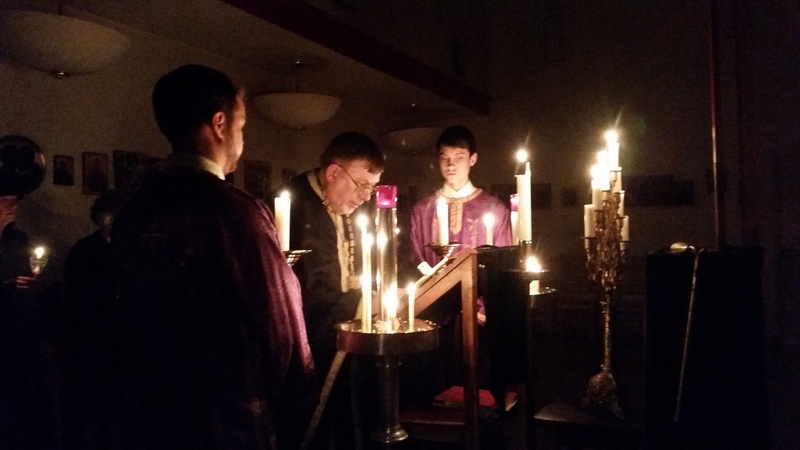 After a period of silent prayer, they kneel, while the Litany of the Saints is chanted, as at the Easter Vigil. This was the practice in churches where there was no font to bless. Then, omitting the Introit, Mass continues. 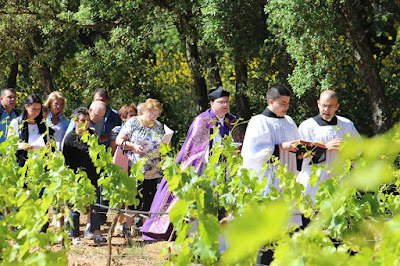 The possibility of the administration of the sacraments of initiation is explicitly foreseen, and is to take place after the homily. This may include baptism, reception, and/or confirmation. If these do not follow, the renewal of baptismal promises takes place (here called “the Memorial of Holy Baptism”), either at the font or done from the chancel. Sicut cervus may be sung if a procession goes to the font. Then, omitting the Prayers of the People and the Penitential Rite (which, in Divine Worship, comes at this point), Mass continues with the Offertory. 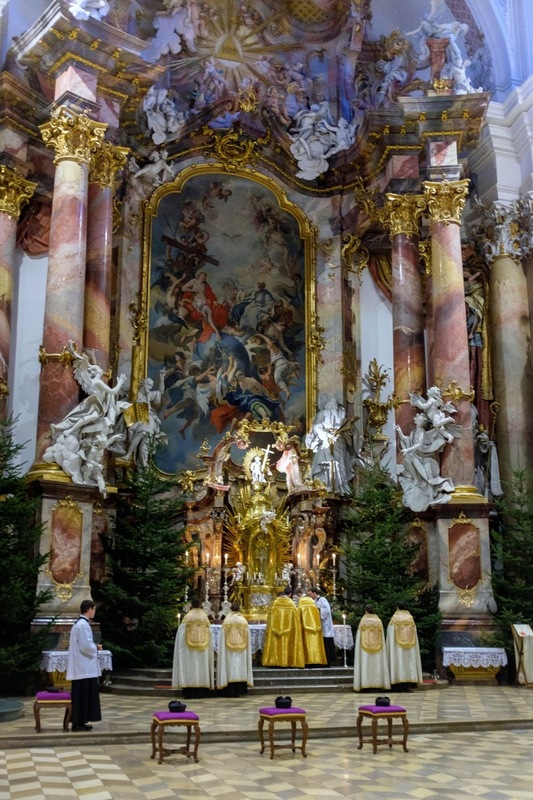 The propers of the Mass are the same as the Extraordinary Form Vigil Mass, excepting the alleluia, which in Divine Worship is Emitte Spiritum, and the Offertory, which has the same incipit, but is shortened. I am pleased to announce that Dominican Liturgy Publications has now published a convenient booklet with the complete text of Compline from the Liturgia Horarum (Liturgy of the Hours) furnished with all the elements from the traditional Dominican Rite that were approved for use with the Proprium Officiorum Ordinis Prædicatorum: Liturgia Horarum (Romæ: Ad S. Sabinæ, 1982). 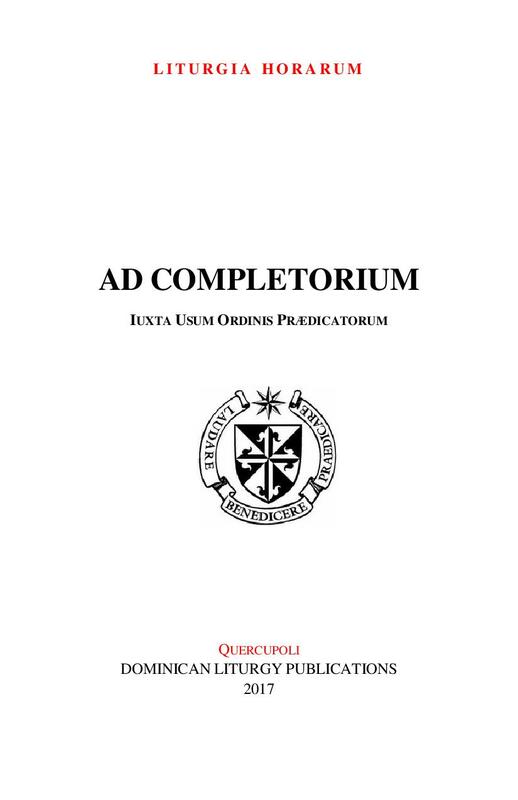 The Compline section of this Proprium was published as a pamphlet but only contained the Psalm and short reading for Compline after Sunday Second Vespers. And that pamphlet has long been out of print. This new edition contains the Psalms and readings for the entire week. It is a pocket-sized paperback and inexpensive. See or order it at Dominican Liturgy Publications. If you want the same texts with all the Dominican chant music, do not order this item. Order this one or this one instead. Here’s a reminder for an event I publicized earlier in the month. Fr Dunstan and Fr Gregory of St Mary’s Benedictine Monastery in Petersham, Massachussetts, dropped me a line about their next monastic experience weekend, in which they hope to give people an experience of monastic life, and men the opportunity to explore a vocation to the religious life. One of the attendees from the last year’s event is now novice, so let’s hope for more. It takes place on the weekend of June 2-4. For further information you can contact Father Gregory at monks@stmarysmonastery.org, or call him at 978–724–3350. For a printable flyer, click here. 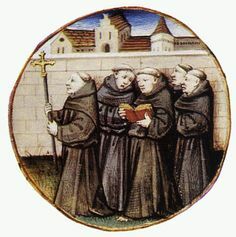 live monastic life as described in the Rule of St. Benedict -- an ancient and proven way still vibrant in today’s world. 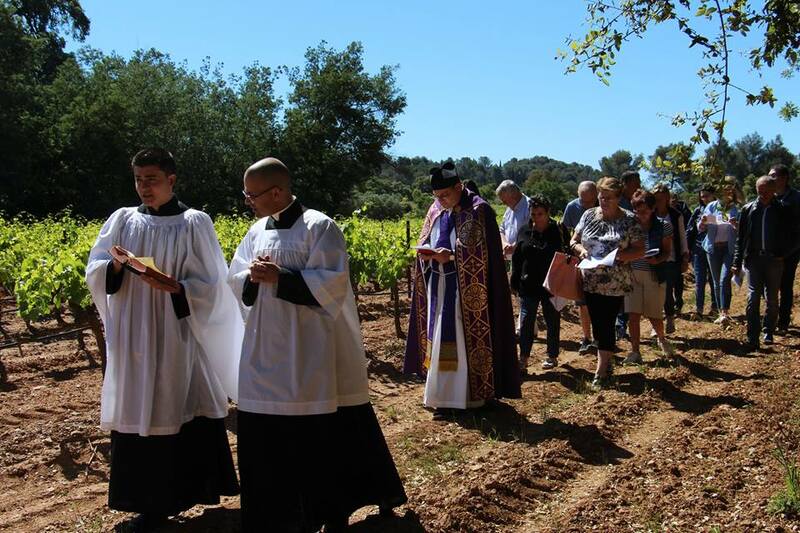 It is a life of prayer and work within the monastery, radically centered on Christ, and structured around the Seven Hours of the Divine Office. We sing this great prayer in Latin using Gregorian Chant with the nuns of St. Scholastica Priory, our “twin community”. We are inviting single men (18-40 years old) for an opportunity to experience from within the rhythm and balance of Benedictine monastic prayer and community life in a house of Benedictine monks. 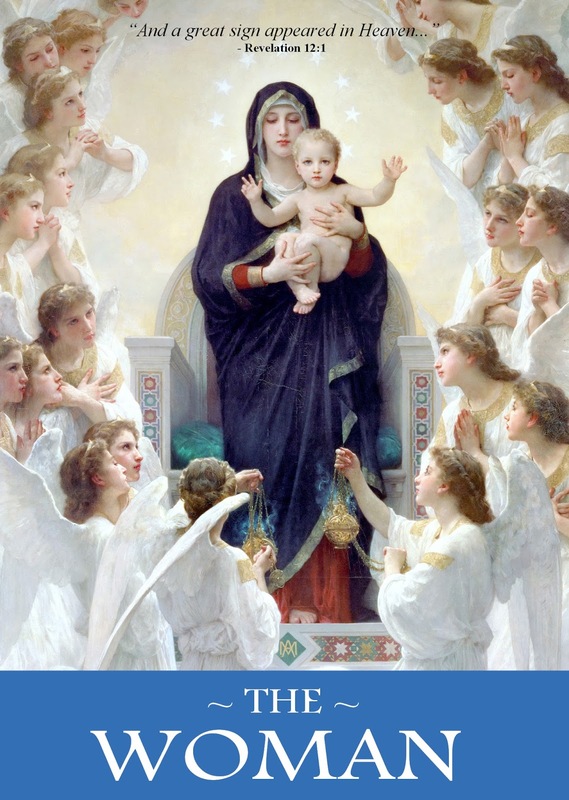 The latest film from St Anthony Communications considers the Catholic teaching about Mary, the mother of Jesus, and her important role in the Church and in the lives of Christians today. The dogmas of Mother of God, Immaculate Conception, Perpetual Virginity, and Assumption are explained along with other traditional beliefs and devotions to Mary. The versus populum posture fashionable today suggests that the priest is there only to give, without first receiving something from God. 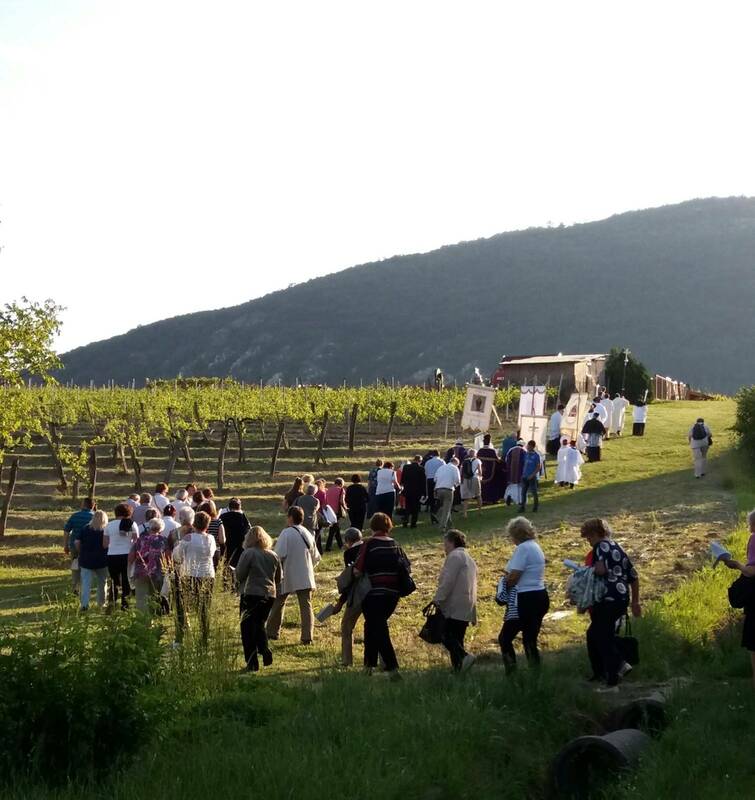 And, since the laity must all “participate” in this activity-privileging event, we often have a whole sanctuary full of actors and givers who don’t seem to have received anything in the first place. 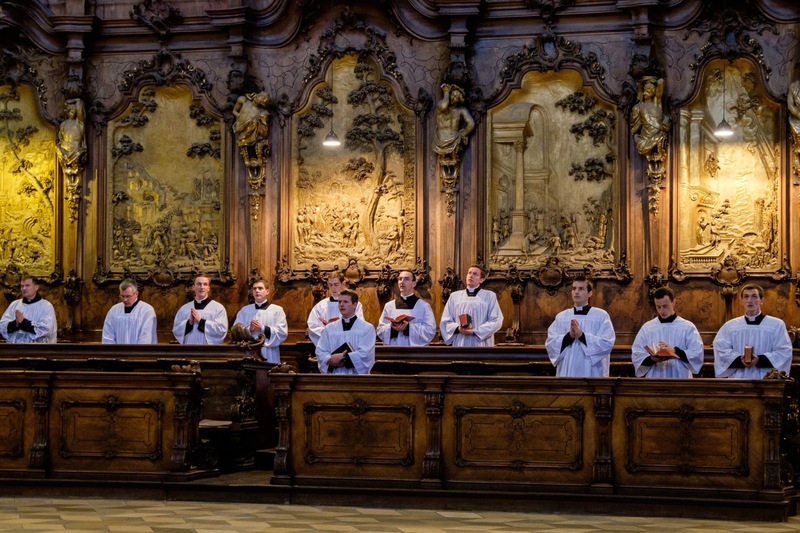 It is no wonder, then, if the modern priesthood is in a crisis of identity and self-respect. The public ritual role he has been given, his highest responsibility, contradicts his essence at every point. Indeed, the usual ceremony provides precious little evidence of the awesome dignity and terrible responsibilities of his office, and often forces him to pawn off nearly all his functions on laymen in the democratic sanctuary, where he begins to look rather superfluous. 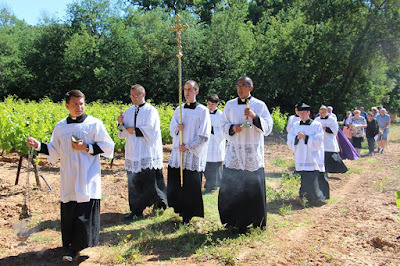 In sum, what the Novus Ordo needs is not only a renewed eschatological perspective, not only a more emphatic turning towards the Lord, but most basically a return to a priestly posture, through a more honest ritual actualization of the priest’s intercessory role, and a sacred choreography that better expresses the metaphysical reality of priesthood. 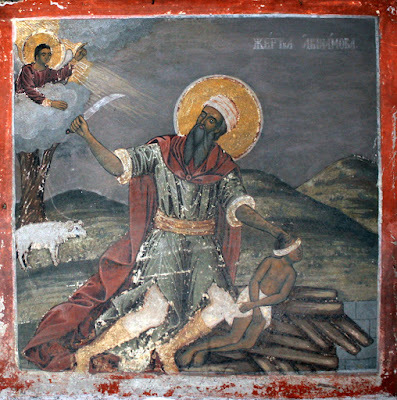 Is the priest a true mediator like Christ and Moses, ascending and descending the mountain to stand in the breach before God, or is he a rebellious Aaron down below, cleaving to the people, fashioning for them a Golden Calf, the idol that always faces the people to give them what they want, because he dare not turn his face to God? The comparison is not unjust; this foundational story is offered to warn us about the fundamental shape of all true worship of the Lord. The sacred authors all see Christ’s priestly ministry as a recapitulation of Old Testament models, and so should we. 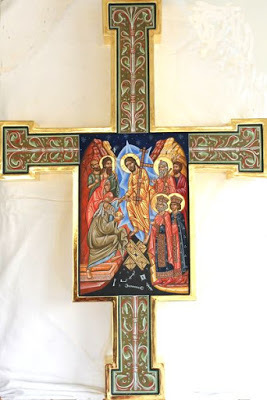 Just as Moses prays and toils on the mountain, entreating for his people in the cloud, so the Israelite priest ascended the Holy of Holies, and so also Christ does carry His cross to Golgotha to make His eternal sacrifice, and after death enter the true Holy of Holies. Scripture provides us these ancient models as the lens through which to understand Christ and Christian worship. 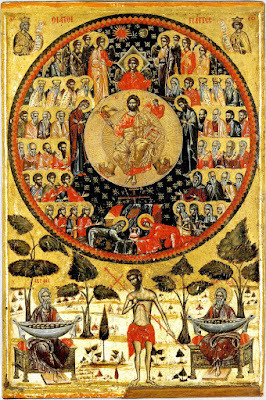 In this respect, as in many others, the new Mass’s ritual forms as commonly practiced, statically versus populum, almost contra Deum, are a misrepresentation, a failure to recapitulate the divine economy of Christ the High Priest mediating and governing His Kingdom from the bosom of the Trinity. 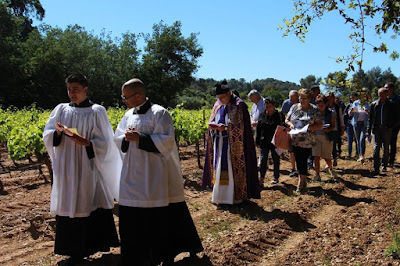 The harried priest relentlessly “engaging” his “assembly” is a ritual expression of the worried tyranny of the idolatrous soul, caught in a spiral of self-contemplation from which he cannot escape. This daily spectacle is harmful not only to the faithful, but to the priest’s own spiritual life and sense of self-worth. This is not at all to say that when we worship with the new Mass, we necessarily fail to pray it with the proper spiritual dispositions, or must deny our dogmatic understanding of sacrificial action, or definitely receive less grace. Of course not! It is to say that the rite itself, as a structure of symbols and actions meant to guide our mind and heart toward the sacramental action at hand, simply fails to express its own interior nature and thus to weld us onto itself. Like a poorly acted drama that fails to engage our attention, it fails to dispose us properly to receive what it communicates: Christ himself. We may know what the action means notionally, and even be able to reproduce it, if we are well formed, in our own hearts; but we are not offered the awesome, stable, visual, physical expression of sacrifice that would be required for us to confess and enact it properly with our whole being, and thus cooperate most fully with the fountain of grace. 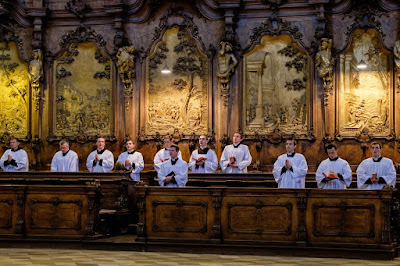 The old Mass’s sacred choreography, combined with all the riches of its other forms of expression—music, text, artistic forms, etc.—is an awesome expression of the theology of sacrifice whose power for spiritual formation never ends. I have suggested that the Old Testament, particularly the Sinai episode, offers models for understanding the proper shape of divine worship. The New Testament picks up on these references, and so did those who crafted the liturgical life of the various churches during their nursery period. 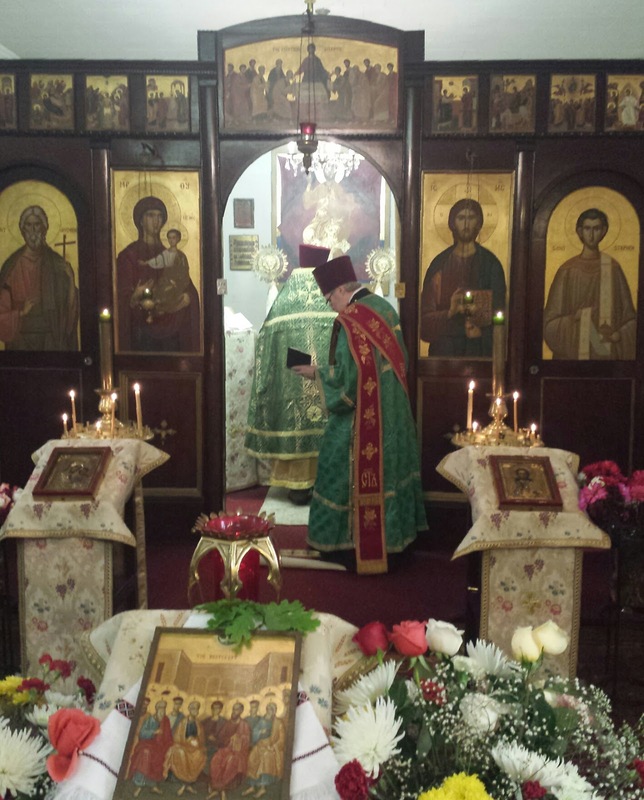 It is the going-up to the altar of God, a holy place, on the part of a High Priest by Whose action we are saved. I propose therefore to explore the ways Scripture in which offers perennially valid orientations for Catholic worship, orientations expressed more richly in the ritual language of traditional rites than in those constructed by mid-20th century scholars. Revelation and redemption both began with God’s offense to man. 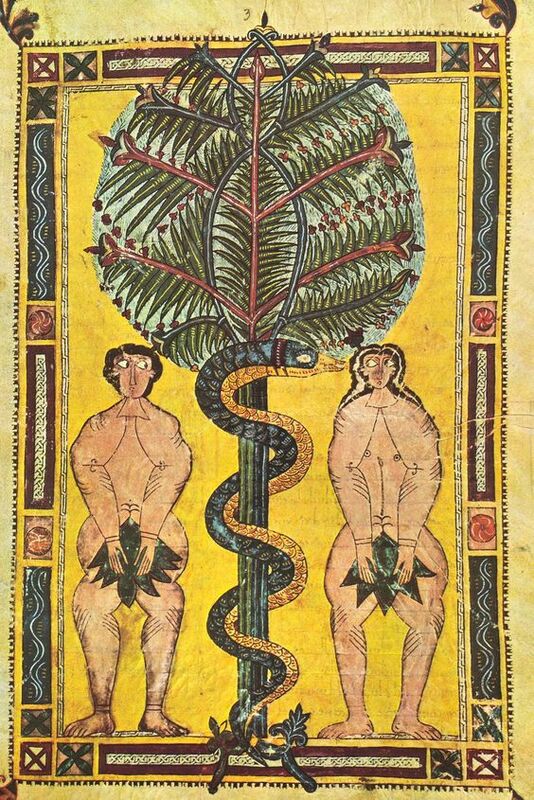 Placed in the garden of delights, Adam is given almost everything, “but of the tree in the middle of the garden you shall not eat.” Here is the smallest obstacle to Adam’s godlike dominion over the earth. When God prepared the way for his Son in the Church, he “called out” Abraham from the bosom of his family and made him a sojourner in a foreign land; later, he even asked him to kill his only son! From then on, one could read the whole fabric of Israelite religion as an attempt to preserve the nature of God as an offense to man: the presence of the Lord cannot be confined in idols, manipulated through ritual, detained within the nation-state (which thus becomes divine! ), worshipped as we please. Under no circumstances is He to be touched. 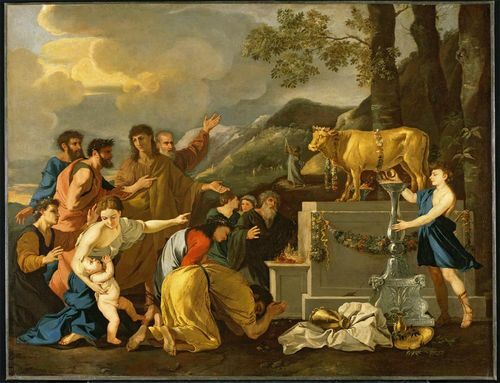 The God of Israel is a god of boundaries, which are meant to protect the Israelites from sacrilege, and teach them the true nature of the transcendent God in a world always guilty of bringing God down to its level. Offense is inseparable from faith, because fallen man is incapable of true faith. He is too willing to believe the serpent’s whisper, that God is just a jealous man like us, or the grumblings of the people, who want nothing more from God in the end than the abundant flesh-pots of Egypt, even if that means a miserable slavery to passion. 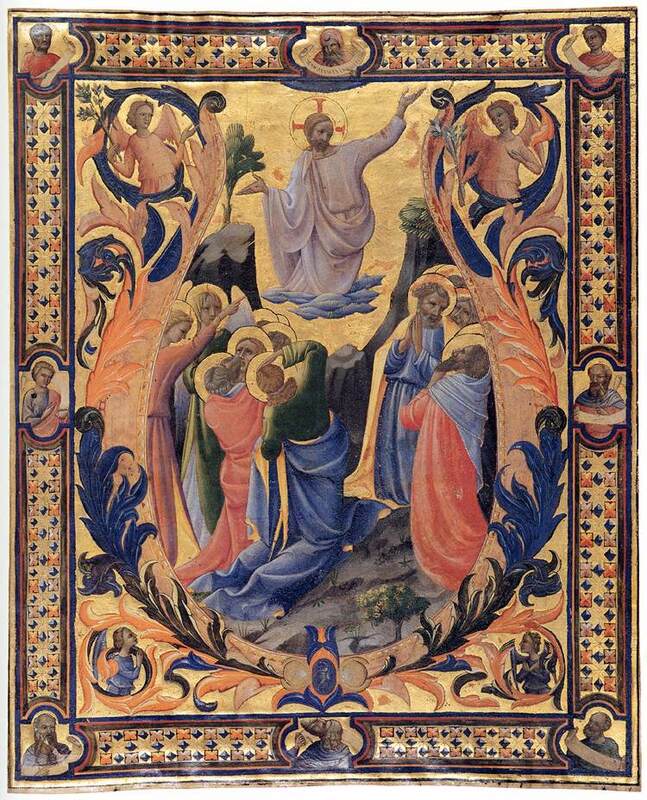 True freedom comes only when man renounces his graspings after God and adores Him in His transcendent majesty. Only after a long training in “offenses” can the people of Israel understand their God, and even then, it takes the rebukes of countless prophets to awaken them from their indifference. We could multiply examples of the “distant” Christ in the Gospels, who runs away from his parents, flees to the mountains, speaks in riddles and gets exasperated with his disciples, drives people out of the temple, and bitterly disappoints Messianic expectations by dying on the Cross. The whole Gospel of John is a sustained excursus in ironies and perpetual misunderstanding between one speaking “from above” to those “from below”! Just as much as the jealous God of the Old Testament, Christ resists being pigeon-holed or tied down to human conceptions, and his closest relationships are tinged with alienation.This is an important point of catechesis for our time. We are too willing to think that the religious worldview of the Old Testament has been largely abrogated and tossed out; but this is an error, and an ancient one at that. Rather, it was elevated and purified, as grace does to nature. 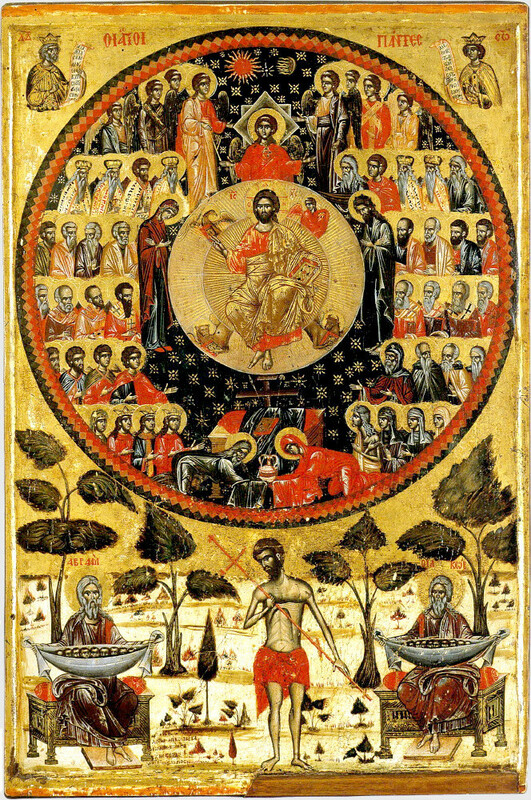 This dogmatic truth entails that all the basic attitudes and practices of the Old Testament are still valid and good, if understood in the light of Christ; further, they are an ineluctable part of the totus Christus. The fear of God apparent on every page of the Old Testament (and for that matter on the lips of all good ecclesiastical writers) is therefore still a Christian virtue. In Jesus of Nazareth, Pope Benedict XVI observed that the perennial fear of the Israelites, that seeing God would bring death, was not proved invalid in Christ’s coming, but is precisely fulfilled by Our Lord.